You know when something is so trendy when it takes over whole the instagram en blogger world. And when a budget store like action is also selling a look a like product, then you know for sure that something is trendy! And then I have it about the weird black toothpaste. Maybe you saw some short movies from this on insta. 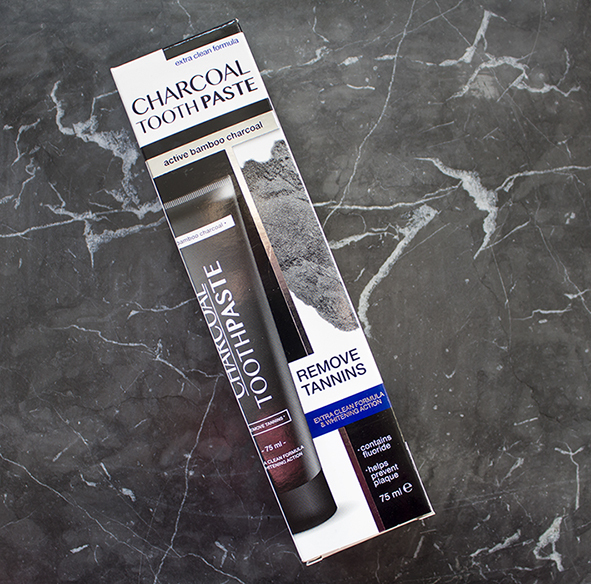 But such a black toothpaste contains charcoal and this promise to make your teeth whiter. I personally love a good and pretty (white) smile so before I already tried a teeth whitening kit. But a toothpaste to make your teeth whiter is something different then a whitening kit. Because a toothpaste is a bit safer and except to make your teeth whiter it also must clean them well. If you know what I mean! 😉 Because I don’t think that anyone loves to walk around with a stinking breath. What does this toothpaste promise? We all know that this toothpaste promise to make our teeth whiter. But what else does this toothpaste do? It claims to remove tannins, prevent plaque and that it’s an extra clean formula. It also contains fluoride. This is simple because I think that we all know how toothpaste works. And this one you also have to use 2x time a day and brush your teeth 2 till 3 min. And after 2 weeks you must see difference and your teeth must look whiter. It doesn’t make my teeth whiter but after 2 weeks they looked a bit less yellow. Buuuut… I find it regrettable that I don’t feel that fresh after brushing my teeth. It’s a cool toothpaste to try out. I even used all the toothpaste , but I’m not going to buy it again. Because therefor is the result not that great enough. I’m going to tell you a cool or better terrible fact… When I was looking online how much the price was from this toothpaste… I found the exact same one on a webshop. And there you could buy two from these toothpastes for… €14,95! That makes around €7,48 for packing! And that when you can buy the same product in the action for only €1,39! Snap ik zeker en vast hoor! Ja, klopt het werkt inderdaad net zoals een normale tandpasta. Ik zie dit zo vaak voorbij komen. Ik zie wel degelijk verschil, maar helaas kan ik zelf alleen met Sensodyne poetsen. Ja klopt, is een hele trend nu. En ah, jammer dat je deze dan niet kan proberen!